The perks for entrepreneurs are many. 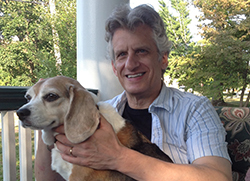 Author Brad Schepp with his dog, JoJo. [Loneliness] can have the effect of smoking two packs of cigarettes a day! You probably also work from a home office, and can tick off the advantages: You can work when you're at your best, wear what you want, run errands when the roads and stores are less crowded, and you can be home when a family member is sick. But there is a major disadvantage: a lack of co-workers. That can also be a good thing sometimes. If you've worked in a company setting, you know just what we mean: Co-workers can bring their own kind of stress. But they also bring company. And that's important. As we've discussed before, loneliness can make you unhappy, less productive and it can have devastating effects on your health, notes Guy Winch, Ph.D., the author of Emotional First Aid: Healing Rejection, Guilt, Failure and Other Everyday Hurts. It can have the effect of smoking two packs of cigarettes a day! Now, solopreneurs can bring people into their lives. You can work out at a gym, meet a friend for lunch, and even go to regularly scheduled meetings with others sellers. But the truth is that day in, day out, you're going to spend a lot of time alone. Brad decided it was time to do something about that: We adopted a dog. Brad resisted the idea for a while. He didn't want to deal with some of the chores that go along with having a pup, like walking, feeding or picking up after a four-legged friend. But now that we've had a dog for six months (a 7-year-old beagle named JoJo) we can say the advantages outweigh the disadvantages by far. And that loneliness issue? Well, while dogs can't replace human companionship, they are great company. Taking care of them ensures that you step away from the computer a few times a day, saving your back and neck. Walking them gets you outside, and getting some of that cardio you need. We took very few regular walks before JoJo. Finally, petting a dog is relaxing. It takes you outside of yourself and your worries for a bit, which is always a good thing. Now, bringing a dog into your life isn't that simple. After working with an adoption specialist at our local animal shelter for a few months, we learned a lot about the adoption process. Here are some tips we picked up in case you decide to look for a furry friend like we did. Be sure to work with the people at the shelter. Tell them you're looking for a "companion," that you work from home and so on. Many shelters assess animals when they're brought in to see how well they get along with other animals and their temperament. In our case, we were fortunate enough to find a calm critter who is happy sleeping the day away (except for affection, bathroom and feeding breaks). Consider adopting an older dog. They're in less demand. Again, JoJo is 7 years old. She's housebroken, has a regular routine and her personality is pretty much set. In our opinion, this is not the time to bring a puppy or even a 1 or 2-year old dog into your life. You are not looking to add stress to your life (and puppies bring as much of that as they do love). Take the time to enjoy all the benefits your pet provides. There may come a time when your new friend is settled into her new home, and while you will always have those chores we mentioned, she may not require all that much interaction. To let her be, and skip a walk, or not spend time petting or grooming her would be missing out on some of the advantages for which you brought the dog into your life in the first place. These are just a few of the lessons we learned along the way. Of course, there are many books and websites out there with plenty of additional advice. There are lots of other dog owners, too. About 37 percent to 47 percent of U.S. households have a dog, according to the American Society for the Prevention of Cruelty to Animals. Those statistics mean, of course, that more than half of all households don't include a dog. If yours is one of those, and you could use a friend for some company, we wholeheartedly encourage you to go out and find your own JoJo. I totally agree! In the past I spent many long hours at my office building my business. Yes, it was lonely but I was busy. Then Miss George - a toy poodle - came into my life. She went everywhere with me. She was a joy to have at work. My office building was next to a lake and George and I would take a walk a couple of times a day. She was a hit with my clients and anyone else who came in my office. She brought so much joy to my life and yes it helps to have someone who loves you unconditionally. Someone who is always there to listen and cheer you up. She did just that and more. I miss her. Thanks for speaking about the wonderful dogs that are available from shelters. If you must have a certain breed, also check into the thousands of breed-specific rescue groups. Another good idea is to foster for a shelter or rescue group and perhaps you will find your soul mate this way.